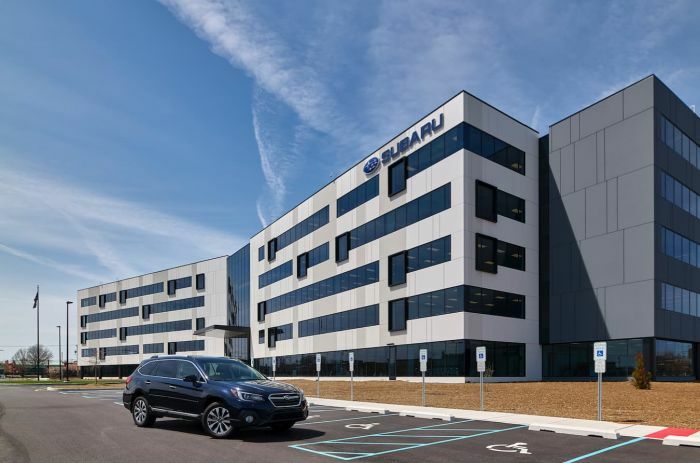 In the same year Subaru of America celebrates 50 years in the U.S., they open their all-new corporate headquarters in Camden, NJ. Subaru brought a display of the automaker’s 50th Anniversary edition models and specially wrapped Outback vehicles to celebrate their new digs. The new 250,000 square feet facility, plus an adjacent new training center, will more than double the size of the automaker’s previous headquarters in Cherry Hill, NJ and bring employees from four sites onto one campus. Like their plant in Lafayette, Indiana, the new Subaru offices will be “zero landfill” meaning nothing from the offices will be sent to a landfill, with waste either being reduced, reused or recycled. The new headquarters building is expected to be LEED certified by the U.S. Green Building Council. Green measures include the use LED lighting throughout the building, reclaimed wood wall décor, as well as carpeting manufactured with partially recycled content. Subaru of America has partnered with the Pennsylvania Horticultural Society to design an HQ landscape that includes the use of native plants that are drought-tolerant and bird-friendly, thus enabling a reduction in irrigation. The new Subaru of America campus, located adjacent to Campbell Soup Company’s world headquarters, is the first new corporate headquarters in the Knights Crossing development which will consist of 1.4 million square feet of innovative office, full-service amenities, ample public greenways when it’s completed. Subaru developed the all-new $118 million corporate headquarters in order to bring together much of its local workforce and provide them with a leading working environment, which it hopes will help spur even more growth. SOA will also transfer its “Love Garden” from Cherry Hill to Camden, where employees grow produce for donation to local food banks. Subaru did not include a picture of the specially-wrapped 2018 Subaru Outbacks but they had a 50th anniversary Outback in front of their new corporate headquarters.